I have news for my readers today. 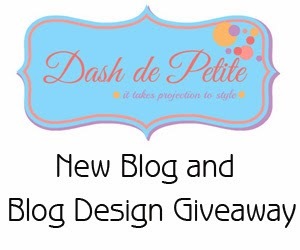 My friend and I have launched a new blog called Dash de Petites. It is a fashion blog but you won't merely be seeing outfits of us petites but also baby fashion and even mom and daughter matching clothes. Bella and I loves to wear matching clothes 'coz it is cute and we feel closer to each other. This new blog was made possible with the design done by Jamie Knupp. The header is just lovely with the social media buttons at the button of the blog name. Well, just take a look at how she designed our blog! It is super cute and nice and neat! Aside from her beautiful design, Jamie of Clueless Momma Designs is also very easy to work with. You can be open to her about any ideas you have for your blog without any worries that you might not meet on the same point because she easily understands it all. I guess, every mommy blogger knows what other blogger wants too! If you want a blog redesign or you are thinking of creating a new blog, you can check on Jamie's design rates. It is so affordable and you will never regret working with her because she is professional and she gives you a great output. Once you see a blog designed by Clueless Momma, you will surely get excited to blog more! Well, any blogger would want to get all these for free! So, join the giveaway now and who knows, you might be the lucky winner! Giveaway starts on March 1-14. Winners will be posted on my Pink Heart String Facebook Page on March 15, 2014. Good luck on your new venture! The design looks amazing! Love the layout in the picture. It's nice and clean, but still has some color, which I love! Love the sample layout! I'm all about clean and simple as much as possible. Love the new design, great job! Wow.. looks good.well Hope to win. The new blog looks great! Congratulations!